If your garden just has a lawn, flowers and shrubs, there’s something incomplete; and that’d be a tree. The true charm of the garden is the beauty of nature in a space that’s yours. Although a well-kept lawn and nice shrubbery looks fine, you’re not really fulfilling the full potential a garden space can offer. A tree can make a good garden great. For kids, especially, a garden gives the opportunity to interact with plants and wildlife in a controlled space – but a space full of discovery. This helps them develop a nurturing relationship with nature. We’ve written a list of all the best flowering trees that give your garden great color, to enhance the overall appearance of your garden, and to make it a wonderful space for the imagination of your kids. However, be aware that it is so important to service trees, to keep them healthy and get the best of your garden space. Dogwood comes in a few different colors, but they all stick to the same palette, and range from a cream white to a dazzling deep pink. Dogwood typically blossoms in the colder seasons. This means that as the rest of your garden loses its color, Dogwood will endure, and provide a bit of beauty that’ll help lift your spirit in the Winer. Is there a better way to celebrate Spring than enjoying an abundance of beautiful flowers? We can’t think of one. 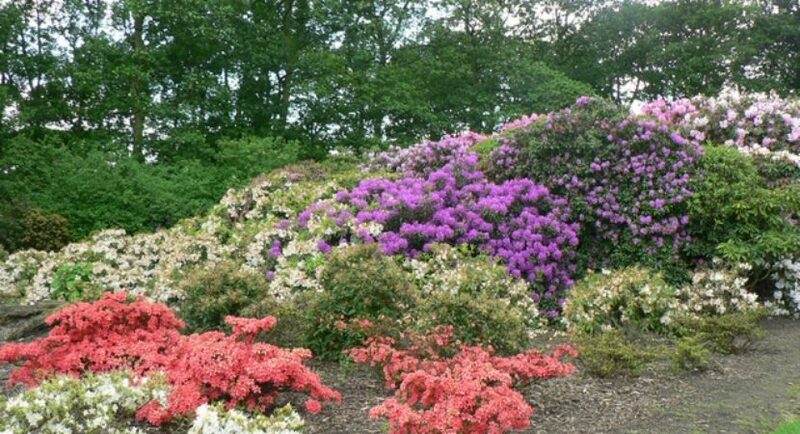 Among all the trees that flower in Spring, Rhododendrons are King. Their trumpet-like blossom springs all over the tree, and they are known to produce one of the richest flowering colors in nature. For those who love the vibe of a Japanese garden, a flowering Crabapple is a great choice. Unlike the traditional Japanese Cherry Blossom, the flowering part of the plant sustains for nearly the whole of the season, not just a month. But it’s similar to the Cherry Blossom in the delicate delight of the bloom and will leave an area of your garden carpeted in enchanting pink petals. Most trees that flower in Spring contain blossoms that are pink or white tones, but as you can tell from its name, the Golden Chain tree isn’t that at all – which merits its inclusion on this list. The long arms of the Golden Chain Tree dangle a cord of golden buds, a deep and rich yellow in color, which should last way into summer. Hawthorn is a tree that offers versatile delights for a garden. In early summer the first white blossoms arrive and spread to cover the whole tree – a little image of snow in a hot season. In fall, the Hawthorn blossoms not with flowers, but with little red fruits. Birds can’t get enough of these, and so will flock to your garden, allowing for some great birdwatching from the comfort of your home. We like the chaste tree, because it waits for all the hubbub and noise of Spring and Summer to die down before it puts on its display, but when it does – what a display. The blossom of a chaste-tree looks a little like the blossom of a bluebell, only with the enchantment of the lilac tones of lavender. As the days get darker, the Chaste-Tree reminds you of all the color the wild has to offer. The Powderpuff is perhaps a generous name for this tree, because although it is a delight, the blossoms appear spikier than light. No need to fear though; the blossoms of this tree won’t hurt a bit, they just give the appearance of something pointy. This unusual blossom is part of the charm of the Powderpuff, and so is its color and endurance. Prepare to see the deep red blossoms of this odd little tree last from Spring through to the end of Summer, for a display that’s so different from those of other floral trees.